Pancreatitis results when the pancreas is inflamed. 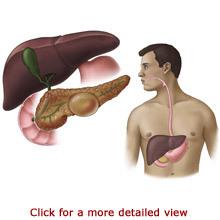 Your pancreas is a gland located near your stomach. It produces fluids that assist with food digestion. Certain conditions can cause the digestive fluids to become trapped inside the pancreas. As the fluids accumulate, they cause pain and swelling. This can lead to pancreas damage and loss of function. Pancreatitis needs to be treated to avoid life threatening medical complications. Treatment for pancreatitis is aimed at treating the underlying cause of the inflammation, relieving symptoms, and restoring function. This may be achieved with medications and in some cases surgery. When you eat, your pancreas produces digestive enzymes and bicarbonates. They travel through the pancreatic duct to your small intestine. Your small intestine breaks down the liquefied food from your stomach even further so that your body can absorb the nutrients. The enzymes break down the proteins, carbohydrates, and fats in the food that you ate. The bicarbonates protect your small intestine from the irritating digestive acids produced by the stomach. The remaining waste products from the small intestine travel to the large intestine. Your pancreas also produces endocrine hormones. Your pancreas releases insulin and glucagon into your bloodstream. These hormones help to control your blood sugar (glucose) levels. Your body uses blood sugar for energy. 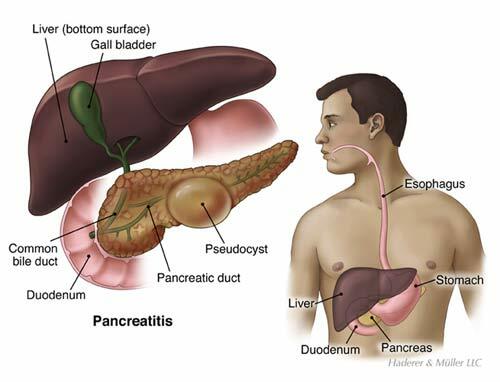 Pancreatitis results when the pancreas becomes swollen and painful (inflamed). Inflammation occurs when the pancreatic duct is blocked causing the digestive fluids to become trapped and accumulate in the pancreas. This can cause autodigestion, a condition in which the ordinarily inactive digestive fluids inside the pancreas become activated and digest the pancreas tissue. Autodigestion can lead to bleeding, infection, and damage to the pancreas. As the condition progresses, the surrounding blood vessels can be affected as well. The damage can eventually cause the pancreas to stop functioning. It may not be able to produce the enzymes to digest fats or make insulin. Diabetes results if the pancreas does not produce insulin. Alcohol abuse and gallstones are the leading causes of pancreatitis. Alcohol abuse-related pancreatitis is more common in men that have been heavy drinkers. Gallstones are solid particles that result from an imbalance of bile components in the gallbladder. Gallstones can cause pancreatitis if they block the pancreatic duct and cause a build-up of digestive fluids. Pancreatitis resulting from gallstones occurs most frequently in women over the age of 50. Several other factors can cause pancreatitis. These include direct trauma, certain medications, hereditary diseases, surgery, infections, structural abnormalities, and high blood fat levels. In many cases of pancreatitis, the cause is unknown. Pancreatitis can be acute or chronic. Acute pancreatitis usually causes mild symptoms that last for a short time. After the episode or “pancreatic attack,” the pancreas returns to normal functioning. Some people may have one episode of pancreatitis, while others experience repeated episodes. Chronic pancreatitis results from scarring and damage from repeated episodes of acute pancreatitis. With chronic pancreatitis, the pancreas does not return to normal functioning after an attack. Instead, the pancreas becomes increasingly damaged over time. Both acute and chronic pancreatitis can be severe and life threatening. Pain is the most common symptom of acute pancreatitis. The pain may start suddenly and be severe or it may start gradually and become increasingly severe. The pain occurs in the upper left or upper middle area of the abdomen. The pain is usually ongoing and may spread to your back and below your left shoulder blade. It usually lasts for a few days. Your pain may become worse after eating high-fat foods, drinking alcohol, or lying on your back. Acute pancreatitis can make you feel very sick. You may experience nausea, vomiting, sweating, anxiety, fever, chills, rapid heartbeat, and mild jaundice. Jaundice is a condition caused by an excess of bilirubin. Symptoms of jaundice include yellowing of the eyes and skin, dark urine, nausea, and vomiting. Your stomach may appear swollen and hurt when you touch it. If you experience acute pancreatitis with an infection or bleeding, you may become dehydrated and develop low blood pressure. In severe conditions, people can develop shock. Shock is a life-threatening condition and requires emergency medical treatment. Symptoms of shock include dizziness, lightheadedness, faintness, or unconsciousness. You may feel confused and anxious. Your skin may be pale, sweaty, cool, and clammy. Your lips or fingernails may turn blue. Additional symptoms of shock include a rapid heart beat, weak pulse, shallow breathing, and chest pain. You should call or have another person call the emergency medical services in your area, usually 911. Repeated episodes of acute pancreatitis can cause prolonged pain and lead to chronic pancreatitis. Chronic pancreatitis is an ongoing condition. As the condition of the pancreas becomes worse, the pain usually goes away. This is not a good sign and an indication that the pancreas has stopped functioning. When the pancreas stops functioning, other complications can develop including diabetes, an inability to digest food, weight loss, bleeding, liver problems, and anemia, a shortage of red blood cells. Your doctor can start to diagnose pancreatitis by reviewing your medical history, surgical history, and conducting a physical examination. You should tell your doctor about your symptoms and risk factors for pancreatitis. Your doctor will conduct tests to help diagnose pancreatitis and rule out other conditions with similar symptoms. Lab tests are used to assess pancreas, liver, and kidney functions. Your blood will be tested for infection, anemia, and blood sugar levels. Imaging tests are usually ordered as well. Common imaging tests include X-rays, Computed Tomography (CT) scans, ultrasound, and endoscopic retrograde cholangiopancreatography (ERCP). An X-ray is used to look for structural complications of the pancreas. A CT scan produces more detailed images than an X-ray. It can show inflammation or damage in the pancreas. The X-ray and CT scan are painless procedures. They simply require that you remain motionless while the pictures are taken. An ultrasound is used to examine the ducts from the gallbladder, liver, and pancreas. It is useful for detecting gallstones, signs of infection or inflammation, and organ enlargement. To take an ultrasound, a technician will gently place a small device on your abdomen. The device transmits sound waves to a monitor for viewing. An ERCP uses an endoscope to view the pancreas and nearby structures for damage in cases of chronic pancreatitis. An endoscope is a thin tube with a light and a viewing instrument at the end of it. After you are sedated, the tube is passed through your mouth and into your small intestine. Dye may be administered to enhance viewing. In some cases, an endoscope is used to remove gallstones or open the ducts to improve the flow of bile or other digestive juices. Treatment for pancreatitis is aimed at treating the underlying cause of the condition, relieving symptoms, and restoring pancreatic function. People with acute pancreatitis are usually admitted to the hospital for care. Depending on their condition, they may need oxygen, pain medication, antibiotics, IV medication, fluids, and nutrition. In some cases, a nasogastric (NG) tube is used to remove stomach fluids to promote healing. A NG tube is made of thin flexible plastic. It is inserted through the nose to the stomach. People in critical condition may need a ventilator to help them breathe. A ventilator is a machine that mechanically breathes for a person until they are able to do so independently. Chronic pancreatitis can usually be treated without a hospital stay. Treatment goals for chronic pancreatitis include pain relief, reducing pancreatic irritation, and improving the ability to eat and digest food. Prescription medication is used to treat pain or aid in digestion. Lifestyle and dietary changes can help with food digestion. You should not drink alcohol. It can help to eat several small meals per day. Meals should be high in carbohydrates and low in fat. People that develop diabetes need to monitor their blood sugar levels and use insulin if their pancreas does not produce it anymore. Surgery may be necessary to remove or repair pancreatic tissues that are bleeding or infected. Surgery may also be used to remove gallstones and sometimes the gallbladder if it is the cause of pancreatitis. The most common surgery is laparoscopic cholecystectomy. Laparoscopic cholecystectomy uses a small lighted camera, a laparoscope, to guide the surgery. A Laparoscopic cholecystectomy uses small incisions, which shortens the recovery time. Acute pancreatitis occurs more frequently in adults than children and in more men than women. Alcohol related acute and chronic pancreatitis is more common in men. Pancreatitis caused by gallstones is more common in women that are over the age of 50 years old. Severe pancreatitis can lead to dehydration and very low blood pressure. This may cause shock. Shock is a life-threatening condition and requires emergency medical treatment. Symptoms of shock include dizziness, lightheadedness, faintness, or unconsciousness. You may feel confused and anxious. Your skin may be pale, sweaty, cool, and clammy. Your lips or fingernails may turn blue. Additional symptoms of shock include a rapid heart beat, weak pulse, shallow breathing, and chest pain. Emergency medical services in your area, usually 911, should be called if shock is suspected. Serious life threatening complications can develop with chronic pancreatitis including bleeding, breathing problems, liver problems, kidney failure, brain damage, and anemia. The pancreas can become vulnerable to infection. Fluid-filled cysts (called pseudocysts) can infect the abdominal area and require surgical removal. If the pancreas stops functioning, diabetes, an inability to digest food and weight loss can occur. Further, chronic pancreatitis is associated with an increased risk for developing pancreatic cancer. The outlook for pancreatic cancer is poor. By stopping alcohol use, you may reduce future pancreatitis episodes, prevent current pancreatitis from getting worse, and reduce the chance of serious complications. Some people with mild pancreatitis may relieve their symptoms by using over-the-counter pain medications, stopping alcohol use, and consuming a liquid diet.